With repeated lack of conception, first evaluate whether your buck may be permanently or seasonally sterile. Bucks can become sterile from heat in Judy or August and that sterility may last until October or November. Older bucks may become permanently sterile from aging. But if the buck is producing with other does, you can be sure the problem lies with this particular pair. First make sure that when they breed he is actually hitting the target and not simply getting the top of her tail or her back damp. Once you are sure that there is not a mating problem and have determined it is a problem with catching (or settling), then consider that the doe may have a low-grade bacterial infection preventing conception. 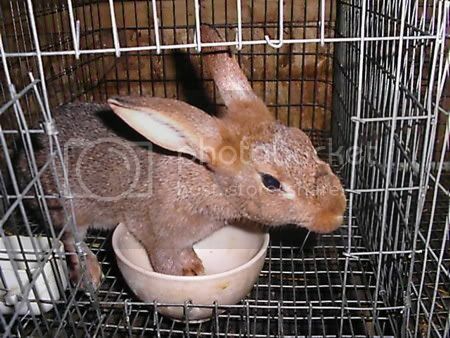 I have treated a couple of my own does with Pen B with success, however, I do recommend that you consult your vet before treating your rabbits (remember, I am not a vet, just sharing my own experiences). Does may also have hormonal problems or structural problems that do not allow her to conceive or remain pregnant. Once you’ve eliminated everything you can treat and/or are willing to treat, you may have to consider that the doe will not work out as a dam. If the dead litter consists of one or maybe two very large kits (2 oz. or more), then rebreed and try to get a larger litter. Small litters of large kits are hard for any doe to deliver. Most of the time, those litters are born dead in my barn, regardless of the dam involved. To increase litter size, I rebreed the doe after one hour. Some breeders also rebreed the next morning. If a doe has dead litters with several normal-sized kits and it is not her first litter, evaluate whether something is frightening or upsetting the doe. Is there a squirrel running across the metal roof, or a new dog in the neighborhood? Is her cage near a window or door where it is more noisy? If you are having problems with many does, consider whether you may be having a feed problem. Compare notes with other breeders in your area on the same and different feeds. Do you see a pattern? It is important that you are comparing notes with those get use feed milled at the same location, otherwise, you are not comparing apples to apples. Some breeders have a three-strikes-and-you’re-out policy. For the most part, I follow that rule myself. But I have had some does that I felt were exceptional enough (or I had such a big investment in them) that I continued past three. In a couple of cases, they had live babies after their fifth dead litter. Looking back, what I thought was exceptional enough to work that hard for may not have been really worth it in the long run. There are really plenty of nice does out there that do produce to be spending your time trying to squeeze babies out of a particular one. Of course, it may take some time and some looking back to see whether it was worth it or not. Many breeders believe that good production and mothering is genetic. If you are trying too hard to get babies from particular rabbits, perhaps you are just perpetuating a problem. One ARBA judge noted that he was very picky about mothering in the beginning and now has very little problem with it. I have noted in my own barns that certain lines are very easy to get babies from while others are a bit harder. On the other hand, the first doe I worked long and hard on to get babies from produced several does for me. Of the ones that I kept track of, two of the three produced live babies on their first try. The third was more like her, but did have live babies eventually herself.